Boston Acoustics unveils compact SoundWare XS 5.1 sub/sat system | What Hi-Fi? The five ultra-compact satellites are two-way speakers, each including a 6.4cm woofer and 13mm tweeter. 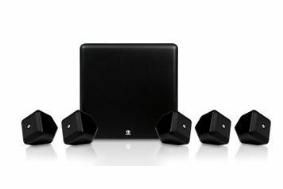 The design uses Boston Acoustics' signature polyhedron shape, said to produce a cleaner sound by reducing standing waves. The subwoofer, matching the satellites in black or white, features a 100W amplifier and 20cm graphite injected polymer woofer. It also uses the company's proprietary BassTrac technology to control low frequencies and keep the bass clean, tight and distortion free. Wall brackets are included for easy installation of the satellite speakers, which can be painted to match your room's decor or placed outside thanks to their weather-proof construction. The Boston Acoustics SoundWare XS 5.1 is available now for £399.90.